Design-wise, the 700 looks about like you'd expect - it's thick, heavy, and filled to the brim with as much customizable RGB lighting as Acer's engineers could possibly include. 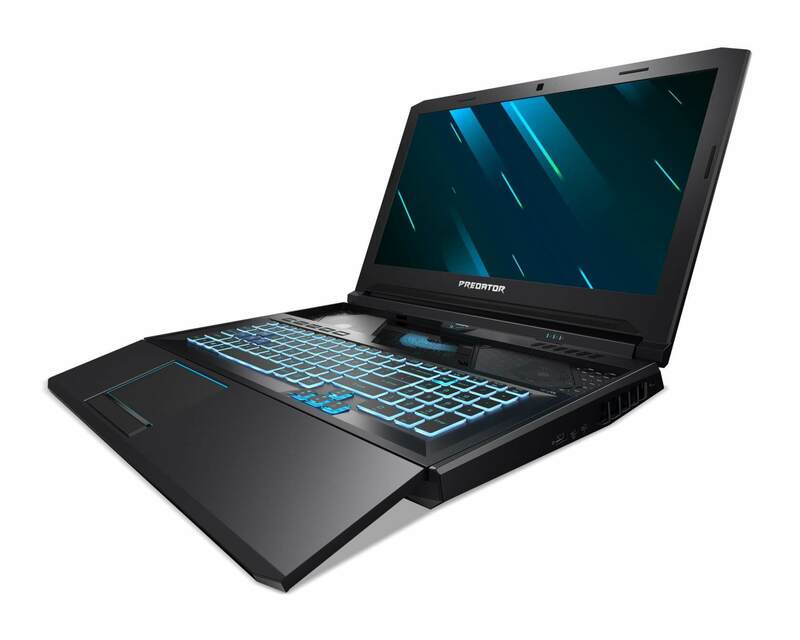 In terms of hardware, the gaming notebook includes a crisp 17" 1080P 144Hz IPS display, up to 64GB of DDR4 RAM, up to an Intel Core i9 processor, and your choice of either an Nvidia GeForce RTX 2080 or 2070. Moving on to connectivity, the 700 seems to have 3 USB 3.0 ports, at least one USB-C port, and both HDMI and DisplayPort support for those who want to use the laptop to power an external monitor. It isn't the device's beefy hardware or size that makes it stand out, though. The Helios 700's unique "HyperDrift" sliding keyboard takes that honor. By default, the keyboard and its touchpad area are where you'd normally expect to see them in a gaming laptop - toward the back, near the speakers. "By simply sliding the keyboard forward, two additional air intakes are uncovered above the keyboard and below the display, giving the powerful heat-generating components extra air flow for maximum cooling and unleashed overclocking. The glass panel also provides a view of the notebook’s heat pipes." Those cooling features will likely be particularly useful for those who want to take advantage of the Helios 700's built-in, one-button Turbo overclocking hotkey. Cooling aside, Acer also says the HyperDrift keyboard will pave the way for improved ergonomics because it allows users to keep a "good distance" from the Helios 700's screen without "over extending" their hands. If the Helios 700 sounds like your cup of tea, it will begin shipping in North America sometime in July for $2,699.